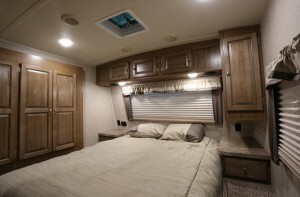 Having your first RVing journey is a memorable and an intriguing experience, to say the least. 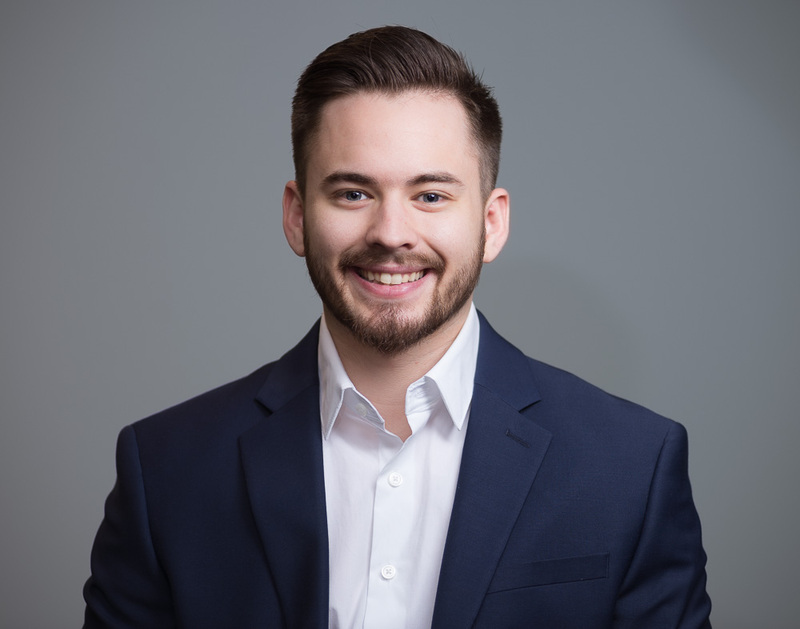 Not only do you enjoy the comfort of your home while on-the-go, you also learn a lot, as well. While a lot of RVs sport the conventional center or back kitchen, you might find that you will love a front kitchen. Not only does a front kitchen provide a more dedicated space, it’s designed to allow you to be able to interact with those in the living area while cooking your favorite meals. 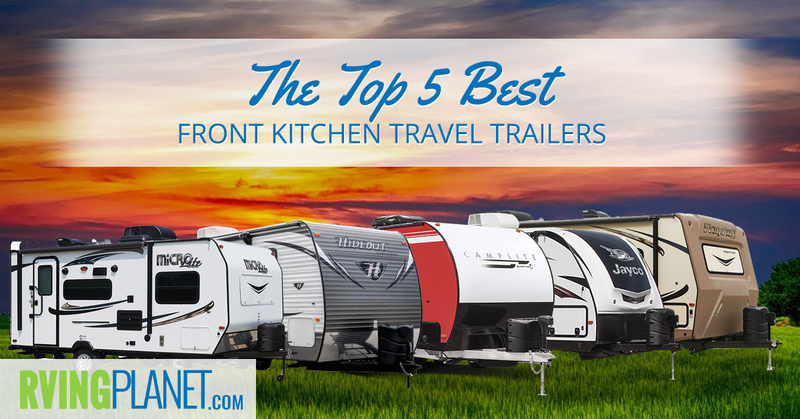 With that in mind, let’s take a look at the best front kitchen travel trailers! What puts an RV on the list: There are more than a few travel trailers with front kitchens. 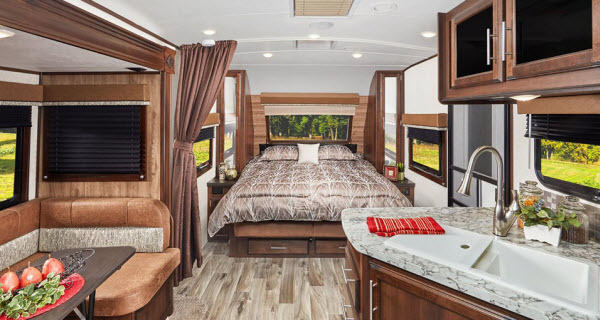 However, the ones that made our list set themselves apart as they provide decent ratings by critics and users alike, are easily available to you, and are newer models so you get the latest features no matter which travel trailer you prefer! 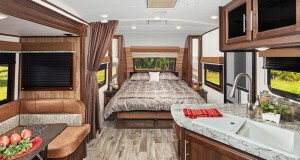 Why we recommend the Jayco White Hawk travel trailer: Jayco’s White Hawk travel trailers boast a myriad of floorplans. The White Hawk 25FK has a front kitchen, but we also recommend taking a look at the White Hawk 24MBH and the White Hawk 28DSBH. Sleeping capacity of 4 to 9 people assures that you have plenty of options to choose from, whether it’s just your family of 4, or your little one’s entire basketball team. 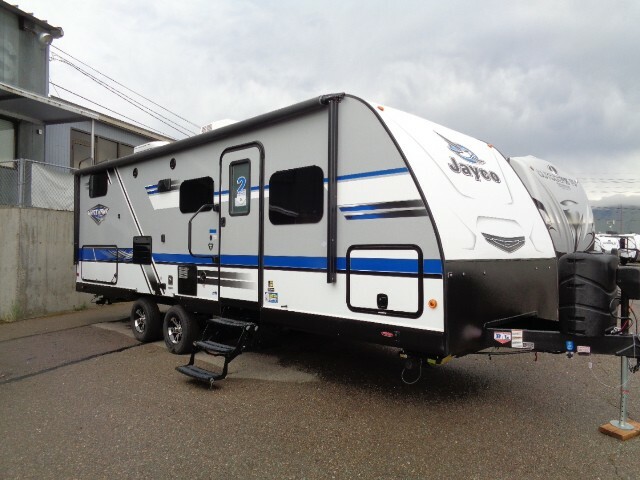 Step inside and you’ll notice that Jayco didn’t skimp out on anything. From LED lighting to the 13,500 BTU air conditioner and the 39-inch LED TVs to the auto-ignition furnace, White Hawk will make you feel right at home. 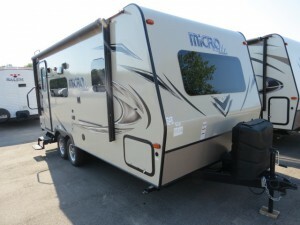 If you still wish for more, there are options to make this RV compliant with Canadian standards. Additionally, you have the option for a kitchen skylight with a shade, solid surface kitchen countertops, another air conditioner with the same 13,500 BTU, and many more. It’s no surprise that so many people love the White Hawk and have recommended it to others! 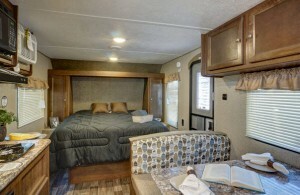 View All Forest River Flagstaff Micro Late Travel Trailer Floorplans! Why we recommend the Forest River Flagstaff Micro Lite travel trailer: The lightweight Flagstaff Micro Lite by Forest River RV is perfect for small families. This can be good if you’re just starting out or don’t have a vehicle that can tow a 5,000 lbs+ travel trailer. It has 17 different floorplans, which should be enough for most people to find something perfect for them. Our favorite picks are the Flagstaff Micro Lite 25FKS and the Flagstaff Micro Lite 19KD, as their front kitchens are beautifully designed. 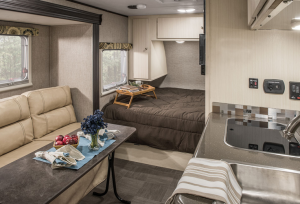 If you wish to spend more time outside but still in the cool of the shade, the 17-inch electric awning has you covered (quite literally), while those inside can enjoy the 13,500 BTU air conditioner with an option to upgrade it to 15,000 BTU. Although, you might be more interested in staying warm with the ducted furnace, as the winter months are upon us. 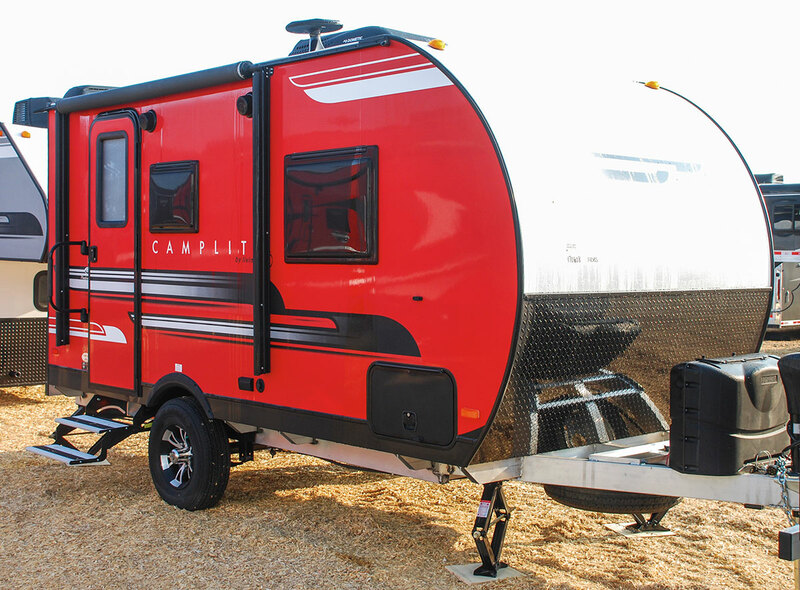 The use of an aluminum frame completes this durable travel trailer, especially when combined with the laminated fiberglass sidewalls. An MSRP of $22,499 say “low cost,” but the features certainly give it a luxuriously expensive feel! Why we recommend the Livin Lite Camplite travel trailer: As we have other travel trailers sporting 10+ floorplans, the Camplite by Livin Lite lives up to the expectations, as it sports 14 different floorplans, the Camplite CL 11FK is the specific floorplan designed with a front kitchen. 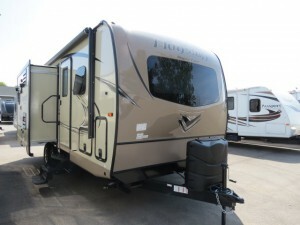 We also liked the Camplite CL 21BHS for its U-shaped dinette and bunkhouse. Because it can house up to 6 people, a 24-feet footprint should provide enough legroom for everyone. It has an impressive feature list, as well. From the tech amenities, like a USB charging station and a 24-inch LED TV, to ones that add to the ambiance as the LED lighting and decorative wood cabinets do, you’ll be loving your vacations. From the vinyl floorings and attractive furniture, it’s all there. People who want more out of their RV than standard options will also love the fact that it can be expanded to accompany additional features, such as a back awning, compliance with Canadian standards, roof jack, a front awning, and many more. 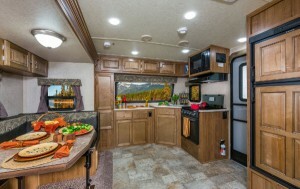 The front kitchen is a huge bonus to this amazing RV. You’ll love being able to spend time with your kids while you’re preparing your meals– and so will your kids! 44 Flavors of Comfortable Camping. 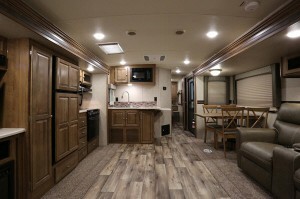 View All Keystone RV Hideout Travel Trailer Floorplans! 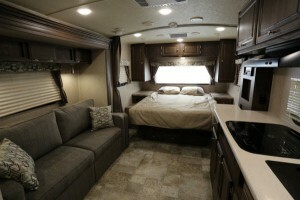 Why we recommend the Keystone RV Hideout travel trailer: Looking for your perfect RV? Keystone Hideout travel trailer should definitely have ‘the one’ with as many floorplans as they provide for you to choose from. As far as a front kitchen goes, the Hideout 30FKDS was designed with it, but others–such as the Hideout 272LHS and the Hideout 27DBS–are just as good. It has a sleeping capacity of 3-10, and a length ranging from 23 to 37 feet, thus making it obvious of its multiple options (and that is before taking into account the upgrade options!). 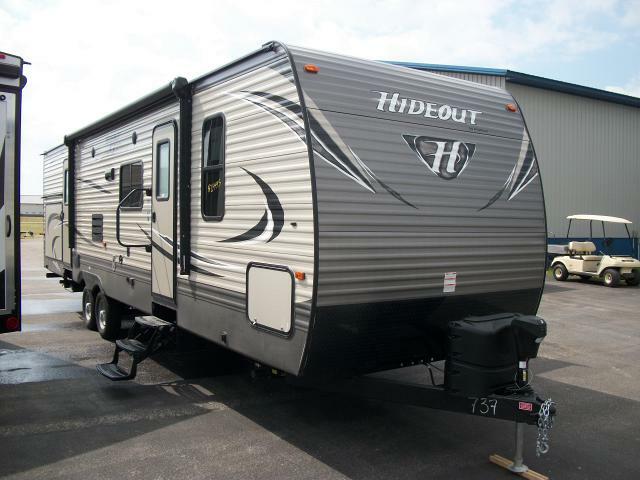 Safety is definitely considered a priority with the Hideout. It features multiple safety measures, some of which include safety chains, CO detector, LP gas detector, fire extinguisher and smoke detector. 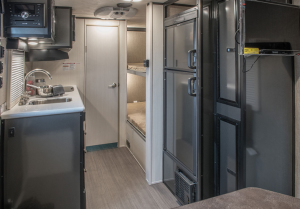 It’s also one of the few RVs that provides features such as a 30,000 BTU furnace, interior surround-sound speakers, a microwave, and a 6 cubic foot refrigerator in its price range. In a nutshell, the Keystone Hideout is a perfect example of a value RV that doesn’t cut corners. 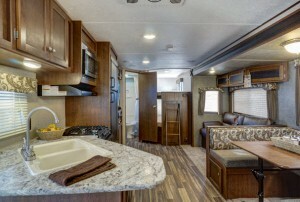 View All Forest River Flagstaff Super Lite Travel Trailer Floorplans! Why we recommend the Forest River Flagstaff Super Lite Travel Trailer: Similar to its brother (the Flagstaff Micro Lite), the Flagstaff Super Lite also features a myriad of floorplans (16 to be exact). 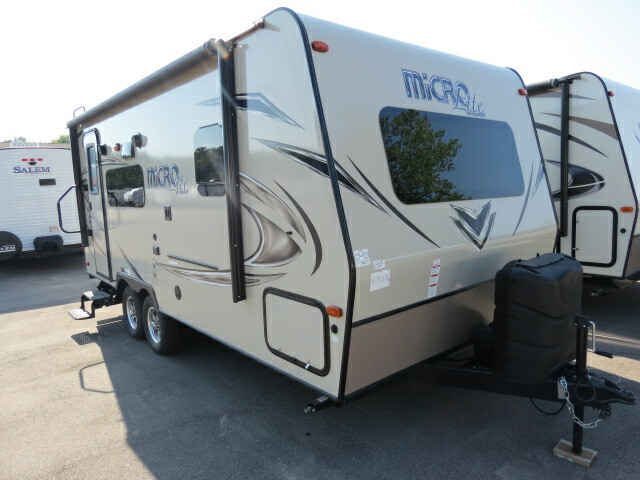 Unlike the Micro Lite, however, it has 2 floorplans that have front kitchens: the Flagstaff Super Lite 26VFKS and the Flagstaff Super Lite 26FKWS. The sleeping capacity ranges from 4 to 10 people with a 25 to 33 feet length, providing you with enough room for you to enjoy the front kitchen and living space. If you would like to customize and add features that you love, the Flagstaff Super Lite is easily upgraded. It has numerous additional options, from a bike rack, to a 15,000 BTU air conditioner. If you prefer to keep it as it comes, this RV will still not disappoint as it provides fantastic safety measures, durable construction, and conventional features that are designed with you in mind. The bottom line: Forest River has built a winner with this one, earning a spot on our list of the best front kitchen travel trailers! The next time you’re heading to your local dealer (or RVingplanet) to search for a great front kitchen travel trailer, this list will definitely come in handy. Time to begin those camping adventures the RV way! 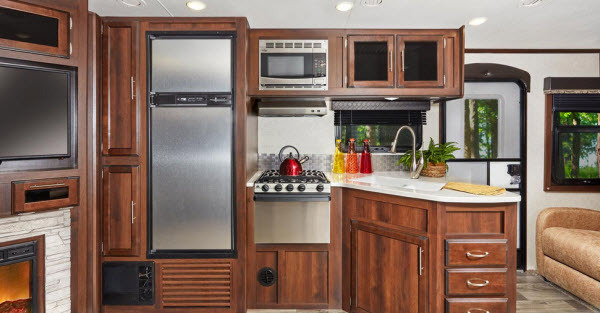 Among these front kitchen travel trailers, which one was your favorite? Share with us in the comments below!